When I purchased this vibrant double faced wool crepe way back in 2014, my plan was to make a skirt. But at some point, I got distracted by a desperate need for wide leg pants. I really loved my wide leg pants but they weren’t getting as much wear as they deserved. My issue was mainly with the crotch. The pants were an amazing fit, but the double crepe was so weighty that it pulled the crotch down when I wore them. It annoyed me. Now the great thing about pants with extreme leg width is that they are incredibly easy to convert to a skirt (assuming you don’t mind a centre front seam). I unpicked the legs and then snipped the tiniest little triangle away from the crotch and inner leg seam. I then just shaped the seams to fit an A-line skirt design. No compromises had to made because there was seriously so much leg fabric to work with. I did the same to the full length silk lining. I’m so in love with this skirt now. It’s beautifully warm and vibrant enough to lift even the dreariest spirits in Winter. Ironically, the weather turned on the charm for this photo shoot. After spending a couple of weeks in the negatives, we had a two days with tops of 13 degrees Celsius. It’s funny how temperature is relative to what you are used to. I would have considered this one of the coldest days of a Sydney Winter, yet in Kansas, we’re kicking the kids outside to play and gardening in t-shirts for the day! Note: If you are thinking about refashioning pants into a skirt, it’s important to note that what I did here will not work unless the pants have extremely wide legs. Most pants or jeans will require extra piecing through the front and back (remember this style of denim skirt from way back). There just isn’t enough fabric in slimmer leg pants for a simple finish in the front. This entry was posted in cashmere, pants, skirt, wool and tagged cashmere, pink, refashioning, skirt on January 18, 2016 by Debbie Iles. I hope everybody had a wonderful Christmas! We had a great day, but not a white Christmas in Kansas. However, I believe we are expecting snow any day now, so it could be a special white birthday for Miss Five tomorrow. Santa was very generous this year. The big guy bought a joint present for all my girls, in the form of a very basic, but well reviewed, Brother XL-2610 sewing machine. I didn’t want to spend a lot of money on a learning machine for my kids (and I wasn’t about to share my Pfaff), but I did want them to have a machine that would be simple to use and reasonably sturdy. So far the machine is working well and the girls are finding it easy to develop confidence on. And because it’s not my precious machine, I’m happy to let them play on it alone without too much anxiety. At the moment, we’re still working on threading the machine and sewing straight lines at a precise distance from the fabric edge, but I’m happy to report that Miss Five has proclaimed it the best present from Santa this year. And while we’re talking about Christmas, I thought I’d share a few little sweaters I made for my girls using an old Kwik Sew pattern in my stash. I modified it slightly to block in a few different fabrics and lengthen the bodice, but otherwise I left it pretty unchanged. Miss Seven’s sweater was made up in a size 8. It’s pretty roomy on her, but my big girls grow like weeds so I always err on the larger size with them. The bodice length is extremely short in the pattern so I also lengthened it by 2 inches before adding the bottom band. The black portion of the sweater is from a new merino jersey sweater of mine (that was too small). The ivory ruffles and tiger fabric were both small remnants in my scrap basket and specifically chosen by the recipients. Miss Five’s sweater is mostly tiger fabric, with a little merino trim. I made this one as a tunic to incorporate the ivory trim better. I also made a standard version of this pattern for her in rainbow French terry. It’s a very simple and practical raglan pattern. This entry was posted in animal print, Christmas, cotton, fabric, jersey, knit, peplum, ruffles, top, upcycling, vintage patterns, wool and tagged fabric, merino, refashioning, sweater, Tessuti Fabrics, tiger, top, upcycling, vintage, wool on December 27, 2015 by Debbie Iles. These pants are such a simple design and are so easy to make that they very nearly didn’t warrant a blog post. I’ve use the pattern several times before and have tweaked it slightly along the way to improve the fit. This time round, I lengthened the legs, and only sewed two channels of elastic in the waistband. The only point of interest in these pants is to do with the fabric I used to make them. It is a wool/acrylic blend in a super soft, loose knit jersey. It’s the same fabric I used to make this grey knit dress. It’s not the type of fabric I’d normally associate a pair of trackie pants with, but boy is it delicious to wear. My inspiration came from a pair of RTW cashmere trackie pants. Unfortunately I didn’t have any cashmere on hand (nor was it in my budget) but this wool blend did a pretty good job. The sad news is that my fabric is going to pill like crazy after a few wears. Agh… once again I am cursing my foolishness in purchasing a synthetic blend. It’s such a waste when they look rough so quickly. It won’t matter too much with these pants though. The comfort factor will be present no matter how they look, and that’s pretty much all that matters to me in Winter! This entry was posted in knit, Mood Fabrics, pants, V8909, wool and tagged acrylic, loungewear, Mood fabrics, pants, Vogue, wool on December 23, 2015 by Debbie Iles. I had a little bit of wool fabric and lining leftover after the making of Miss Seven’s tailored coat. It was precisely the right amount for ladies skirt. Fancy that. My original plan was to make a simple, straight skirt using my own skirt sloper. However, when I laid out the wool, it was a lot wider than I remembered and it suddenly seemed a shame to limit myself to a pencil skirt when there was clearly more fabric I could work with. Starting with a basic pencil shape, I left the back skirt piece unchanged. 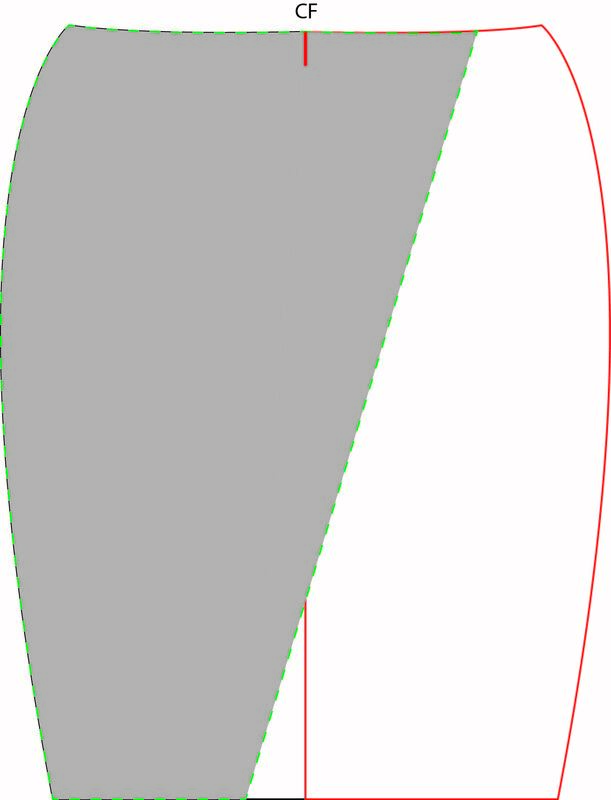 I then traced the front skirt piece in full, mirroring the pieces as if to avoid cutting on the fold. In the diagram below, the grey shaded pattern is my altered front piece. I extended the waist along the existing pattern line and shortened the hem width a little. I then simply connected these points with a diagonal line. It was very important to identify and mark the CF point. This was a perfectly fitted skirt pattern and those CF points needed to match up when I wrapped the skirt around. I cut my lining pieces to the same pattern as the outside fabric, minus about 1.5 inches in hem length. Although, to be honest, I always reduce my seam allowance a smidgen when I sew the lining to make sure it ends up a tiny fraction looser than the outside fabric (you don’t want to end up with any pulls or tension visible on the outside). I sewed the hems of the lining and fabric together first and then turned the skirt out and basted all the other sides together. I bound the CF edges with the opposite side of the wool fabric, although the contrast is totally unnoticeable. I then attached the contrast (once again unnoticeable) waistband and fastenings. The skirt I made is a true wrap skirt. It is fastened inside with a ribbon bow and secured with a hook and bar on the outside. I added a leather fastener over the hook and bar for aesthetics. The same pattern pieces could easily be used to create a mock wrap skirt. There would need to be an invisible zipper placed at the side or back. I’d also crop the top portion of the (underlayer) front piece so there is little overlap with the top layer and therefore, reduced bulk at the waistband. This would need to be stitched in place which would limit the freedom of movement that you get with a true wrap skirt, but the benefit would be a sleeker, less bulky front. It’s something I might try next time. This entry was posted in acetate, fabric, floral, Mood Fabrics, self-drafted, skirt, wool and tagged acetate, coating, lining, Mood fabrics, pencil skirt, pink, skirt, wool, wrap skirt on October 14, 2015 by Debbie Iles.